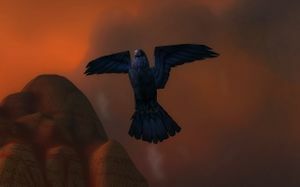 Khadgar flies in raven form from Karazhan to the Stormwind throne room as he speaks. 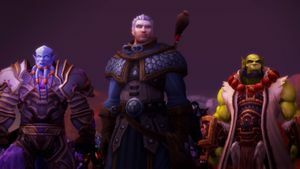 "On Draenor, old rivals sought to bring Azeroth to its knees. 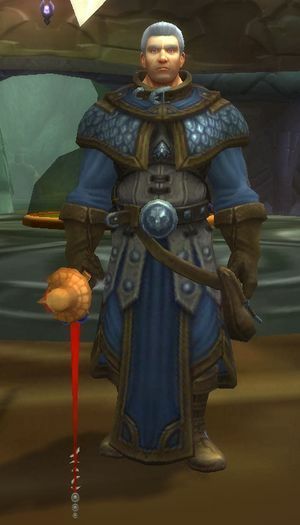 And while the iron tide was quelled, they were but servants of a more ancient foe that has not forgotten our defiance. The vengeance of the burning shadow has come. And in our most desperate hour, we must wield the power of the enemy against them. 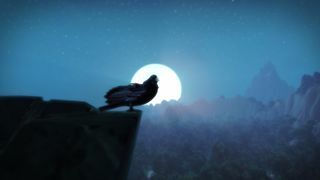 For we stand, once more, upon the brink of destruction." 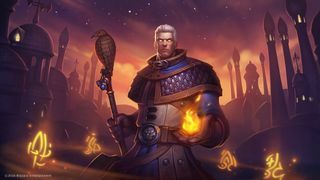 Khadgar lands before Varian and Anduin Wrynn and transforms back into his human form. 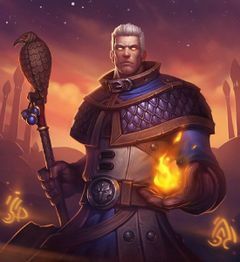 "The Burning Legion has returned." 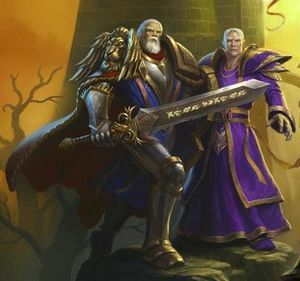 ↑ 4.0 4.1 Warlords of Draenor Official Site "Perhaps the most accomplished of all living wizards..."
↑ 《吉安娜·普罗德摩尔：战争之潮》, 253 (ebook). 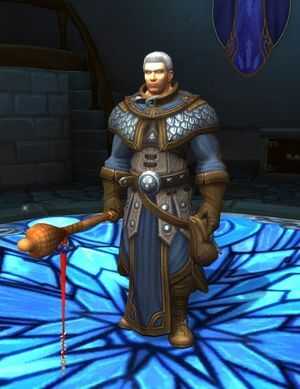 "Khadgar, one of the most powerful magi in Azerothian history." ↑ 11.0 11.1 Rosenberg, Aaron. 《Tides of Darkness》, 10. ISBN 978-1-4165-3990-2. 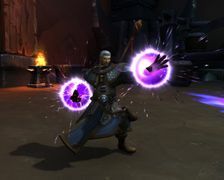 He was reliving the battle in Karazhan, and experiencing again that horrible wrenching sensation as Medivh drew from him his magic and his youth. The magic had returned—indeed, in many ways it was far stronger now than before—but his youth was gone, torn from him long before its time. 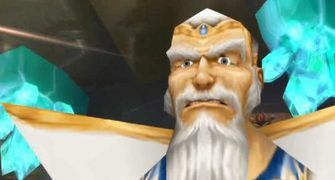 He was an old man now, at least in appearance. 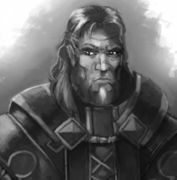 He still felt hale and hearty, and had as much endurance and strength and agility as ever, but his face was lined, his eyes deep-set, and his hair and fledgling beard a stark white. 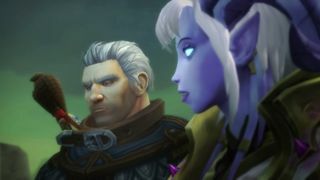 Though only nineteen, Khadgar knew he looked three times that and more. ↑ Rosenberg, Aaron. 《黑暗之潮》, 163. ISBN 978-1-4165-3990-2. ↑ Rosenberg, Aaron. 《黑暗之潮》, 331. ISBN 978-1-4165-3990-2. 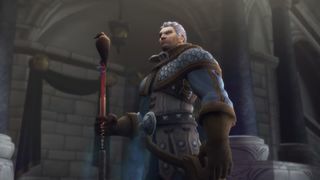 ↑ 15.0 15.1 Archmage Khadgar. 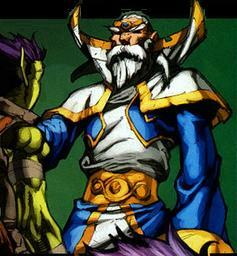 Blizzard Entertainment. Retrieved on 2015-08-02. ↑ Rosenberg, Aaron; Christie Golden. 《穿越黑暗之门》, 261. ISBN 978-1-4165-5086-0. ↑ 18.0 18.1 18.2 Blizzard Entertainment Inc. 2007-04-19. Crisis at the Portal (English). 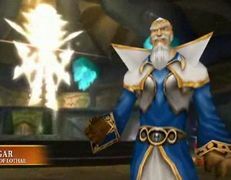 News From Outland: Crisis at Da Portal. Retrieved on 2009-07-20. ↑ 《穿越黑暗之门》第十六章"I became an old man at seventeen." 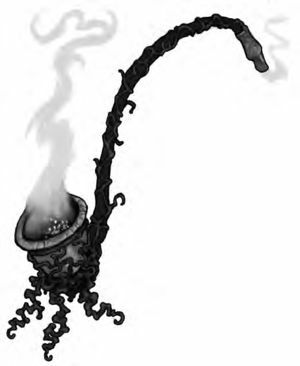 ↑ "Curse of the Blood Elves: The Dusts of Outland", Warcraft III: The Frozen Throne. 暴雪娱乐. 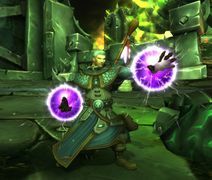 ↑ Alleria's Journey, Human campaign, Warcraft II: Beyond the Dark Portal.